SOLAR ACTIVITY: The sun is coming to life. There are several new-cycle active regions scattered across the solar disk and the limb of the sun has some very photogenic prominences. Readers with solar telescopes should dust off their optics and take a look. "It was stunning!" he says. "I photographed the display using a Canon 40D set at ISO 800 for 4 seconds." Arctic people should take note of those settings. 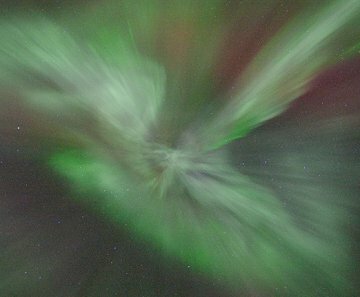 The solar wind is still blowing and the auroras could return tonight. NOAA forecasters estimate a 20%-30% chance of high-latitude geomagnetic activity. On Oct. 7, 2008, asteroid 2008 TC3 hit the atmosphere and exploded over Sudan, creating the cloud pictured left. On Nov. 18, 2009, a similar-sized asteroid hit the atmosphere and exploded over Colorado and Utah in a flash of light that startled onlookers across at least eight states. Hours later, daybreak revealed the "mystery cloud" pictured right. It looks just like the debris from 2008 TC3. 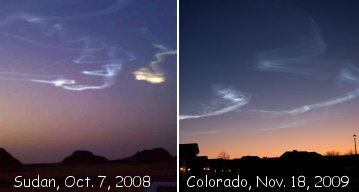 Both clouds resemble icy noctilucent clouds that form naturally around Earth's poles during summer or in the aftermath of rocket launches. Researchers have long suspected that space dust can prompt the formation of noctilucent clouds by acting as nucleation points for high-altitude ice crystals. Dusty debris from exploded asteroids may serve this purpose quite nicely. The explosion of 2008 TC3 in Oct. 2008 produced meteorites that were later recovered. The asteroid-blast of Nov. 2009 probably produced meteorites, too, although researchers aren't yet sure where they fell. Stay tuned for updates. On November 20, 2009 there were 1082 potentially hazardous asteroids.